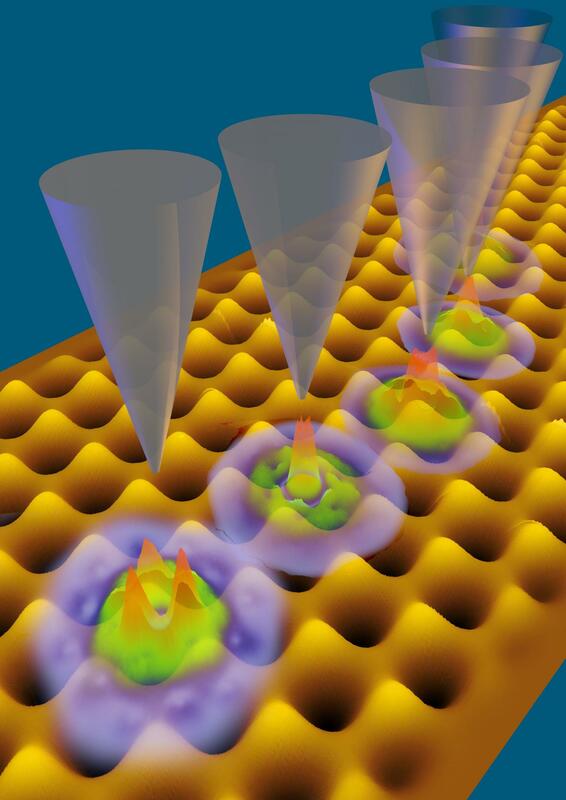 Two novel materials, each composed of a single atomic layer and the tip of a scanning tunneling microscope – these are the ingredients to create a novel kind of a so-called "quantum dot". These extremely small nanostructures allow delicate control of individual electrons by fine-tuning their energy levels directly. Such devices are key for modern quantum technologies. The theoretical simulations for the new technology were performed in the team of Prof. Florian Libisch and Prof. Joachim Burgdörfer at TU Wien. The experiment involved the group of Prof. Markus Morgenstern at RWTH Aachen and the team around Nobel-prize laureates Andre Geim and Kostya Novoselov from Manchester who prepared the samples. The results have now been published in Nature Nanotechnology. „For many applications in the field of quantum technologies one requires a quantum system were electrons occupy two states – similar to a classical switch – on or off, with the difference that quantum physics also allows for arbitrary superpositions of the on and off states" explains Florian Libisch from the Institute for Theoretical Physics at TU Wien. A key property of such systems is the energy difference between those two quantum states: "Efficiently manipulating the information stored in the quantum state of the electrons requires perfect control of the system parameters. An ideal system allows for continuous tuning the energy difference from zero to a large value" says Libisch. For systems found in nature – for example atoms – this is usually difficult to realize. The energies of atomic states, and hence their differences, are fixed. Tuning energies becomes possible in synthetic nanostructures engineered towards confining electrons. Such structures are often referred to as quantum dots or "artificial atoms". The international research team of TU Wien, RWTH Aachen and the University of Manchester now succeeded in developing a new type of quantum dots which allow for much more accurately and widely tunable energy levels of confined electrons than before. This progress was made possible by combining two very special materials: graphene, a conductive single atomic layer of carbon atoms, and hexagonal boron nitride, also a single layer of material quite similar to graphene except that it is insulating. Exactly like graphene boron nitride also forms a honeycomb lattice. "The honeycombs in graphene and hexagonal boron nitride are, however, not exactly of equal size" explains Florian Libisch. "If you carefully put a single layer of graphene on top of hexagonal boron nitride, the layers cannot perfectly match. This slight mismatch creates a superstructure over distances of several nanometers, which results in an extremely regular wave-like spatial oscillation of the graphene layer out of the perfect plane." As the extensive simulations at TU Wien show, exactly these oscillations in graphene on hexagonal boron nitride form the ideal scaffold to control electron energies. The potential landscape created by the regular superstructure allows for accurately placing the quantum dot, or even moving it continuously and thus smoothly changing its properties. Depending on the exact position of the tip of the scanning tunneling microscope, the energy levels of the electronic states inside the quantum dot change. "A shift by a few nanometers allows for changing the energy difference of two neighboring energy levels from minus five to plus ten millielectronvolts with high accuracy – a tuning range about fifty times larger than previously possible", explains Florian Libisch. As a next step, the tip of the scanning tunneling microscope could be replaced by a series of nanoelectronic gates. This would allow for exploiting the quantum dot states of graphene on hexagonal boron nitride for scalable quantum technologies such as "valleytronics". „This emerging new field is quickly becoming a center of attention", comments Florian Libisch. „There are multiple potential technological applications of these atomically thin materials – that is also why the TU Wien has also very recently established a special doctoral college focused on two-dimensional materials."